If you were thinking to subscribe to Linux-Magazine.es you might want to have a look at this offer, which lets you to pay the amount you want for 6 issues (well, actually it has to be >= 2€ but 2€ for 6 magazines borders stealing in my opinion :D) and you even get to choose to donate 10% to KDE España or other Free Software organizations. 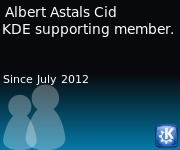 In KDE España we are looking for a group or organization in condition of co-organizer for Akademy-es 2012. If you are interested have a look at the call for locations page. If you are interested do not forget to send your submission in before February 25th. Obviously this does not mean that they will not released with KDE since each translation team has a different work schedule and some of them only work when really close to a release, but if you are a user enjoying KDE on one of the above languages you should think on volunteering to do some work so it stays that way. This is your opportunity to make a difference, write me to aacid@kde.org and join KDE by working on translations!